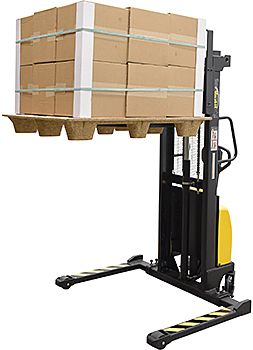 The Vestil SE/HP-63-AA Electric Straddle Stacker features manual push operation with two ways to raise/lower the forks: the first is 12v powered lift and the second is via a manual hydraulic hand pump. 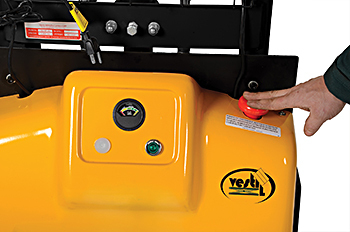 The versatility of having two lift methods ensures that the stacker can still be used if the batteries are exhausted. 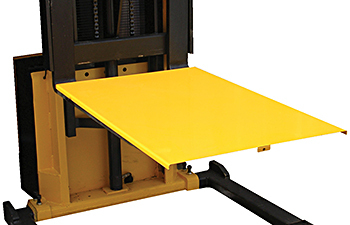 Adjustable width forks and adjustable width straddle legs make this straddle stacker ideal for handling standard pallets or skids. Stacker is designed to transport and stack pallets and skids weighing up to 2,000 LBS to a maximum height of 63". Forks are 6”wide and 42” long (21" load center). Two 12V, 40Ah batteries, integral battery charger, and battery charge indicator gauge come standard. 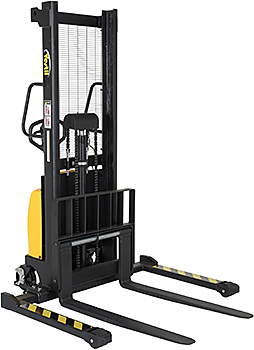 The SE/HP-63-AA electric pallet stacker is all steel construction for years of reliable service. The Vestil SE/HP-63-AA features adjustable forks and support legs and can be used to lift standard pallets or skids. Adjustable forks adjust from 12¼"W O.D. to 26¾”W O.D. Adjustable support legs adjust from 48"W O.D. to 58”W O.D.